Angelique Armae grew up in Brooklyn, New York. Her favorite toy was Emerald The Witch, a small doll with green eyes, green hair and purple skin. 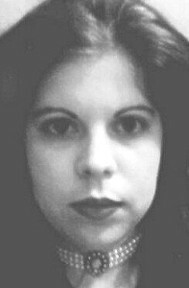 Looking back, Angelique says, "I have always had a love for the paranormal. Whether it was a doll with flashing green eyes, or a magical Mary Poppins-like nanny, I've always been intrigued by mystical, magical things." Miss Armae's books and novellas have garnered numerous awards and nominations, including the Sapphire Award, P.E.A.R.L. Award, & Word Weaving Award. Her first book, COME THE NIGHT, made Fictionwise's Best of the Best list, rounding out the top five best selling dark fantasy books of the year. The first of her new vampire series, DEAD WALKERS, is now available from ImaJinn Books. Aside from writing, Angelique is an award-winning digital artist. She is the recipient and two time nominee of the Dream Realm Award for best cover art. She enjoys traveling, learning about the ancient Celts, exploring history, and learning new languages. Angelique studied history and French literature at Skidmore College. Currently, she is tackling Gaelic Irish. NEW VIDEO FOR SHADOWS OF THE SOUL!